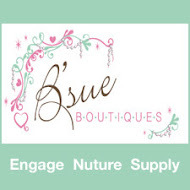 Hello and welcome to another fun Blog Hop hosted by B'Sue from B'Sue Boutiques. Today is OK to be messy, but to talk about my mess I have to tell you how it all started. “Once upon a time there was a girl who liked to play with neat things and everywhere she walked she left behind a trail of beads." On the beginning of my jewelry path things were very much disorganized; well you know beginnings are always messy. Because it was a new business I didn't have much to work with or a place to make my creations, so I worked on the couch with a tray on my lap and also on my husband's desk, and that way I left my mess (and beads) behind wherever I was. After just a few months I moved to the kitchen with my small folding table next to our dining table, let me tell you, trying to cook and bead at the same time it was a lot of trouble! I was in the kitchen for a while until I had so much stuff (or for my husband it was so much mess) that he awarded me with a major upgrade: the basement!!! I cleaned and improvised tables, fixed cabinets, got new organizers, and more. The trouble is that there isn’t any heat at all and it is freezing almost all the time; but it’s worst during the winter because it’s like working at the north pole! Sorry Santa but even the elves work in better conditions than I do. But OK I finally had my space, no more: "Sweetie can you move your beads a little bit so I can eat on the table? ", “No of course you can't move my beads, don't you see that there is a design going on there? But I guess you can put your plate over my organizers”. For my poor husband it was a miracle he didn’t find a pearl or a Murano glass in his food. Even with temperatures below zero and with poor lighting I have to admit I love my little creativity cave; it's perfect with my crappy 1970’s style carpet and the crazy purple ceiling I simply enjoy saying: I have a workshop!. About the mess well its messy all the time, just that there are different levels of the mess. Sometimes the mess is worse than other messes. But how this scary, mind blowing, and unthinkable mess came to be; well that's easy. Last year after the summer-fall festivals the Christmas festival arrived, and with all that work and running with almost no sleep by the time my last festival ended I was really worn out. All I wanted to do was to sleep until it was time for my trip to Peru. So I stuffed all of my shows decor, my leftover inventory, and everything else in my poor little workshop and I left (also add up all the unfinished projects on my tables). 3 months later my sweet husband tried to help clean while I was gone, and of course he was clueless to where things belonged and that ended up in yes... more mess! So here it is my awesome mess and it was waiting for me all these months! I'm not embarrassed, this is truly the essence of my work: some dirty paint brushes, pieces of metal and chain on the floor, those tiny seed beads that fell off one night before my last show, and what about the ink that spilled on my chair. Yes this is my studio, all you need to do is just picture me during the nights, sometimes laughing while watching movies, some others almost crying because I made a fatal mistake, and there are some days where I had fallen sleep in a very uncomfortable chair and woke up with E-600 glue on my hair; that's my life! So my friends... Hurray to mess!!!! Sadly the mess can't last forever... I had to clean up. Cynthia Wainscott <--- You are here! It has been a long time since my last post and I apologize for that. It's always so difficult for me to write, my mind goes crazy and there's so many things I want to say. I give myself many excuses to don't start but also is the fear of: "oh what If nobody likes what I write, and what if I make a mistake... To be honest I have the same fear giving speeches, I can't breath, and I sound funny, even my legs shake!, but every once in a while I like to challenge myself with a healthy dosage of fear. To me fear is like a vaccine, you get a little bit of the disease so you can overcome it later. My friend B'sue inspired me to keep going with a blog post that suited me well: "for those of you who think they have nothing to blog about" Thank you Brenda!, when I read this I decided that it was time to get back on the horse ( or the Llama) and not let go. So here I am, to stay, with so many goals for this year, and the hope to take my art and my Jewelry business to another level and most important: Fearing no more. I saw this Llama on the streets of Lima city, unusual there, but really cool to see it walking with all those bright and beautiful colors!. 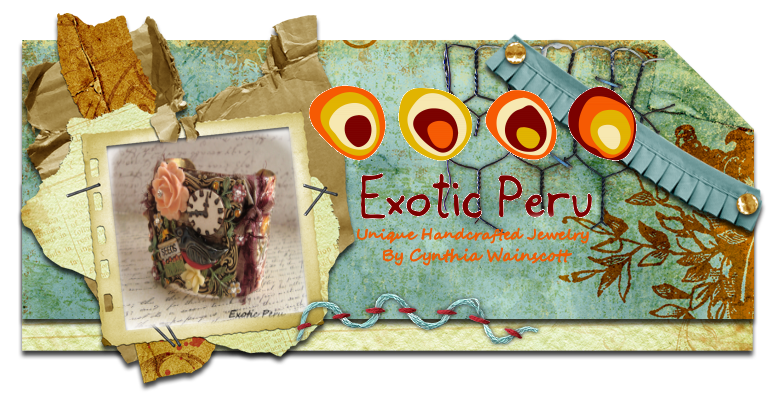 And to all the Exotic Peru fans I will be reopening my Etsy Store soon, you always can catch up with me here or in my facebook page. I'm trying to adapt again to go back to my business, getting ready for the summer festivals and being a good mommy for my very - VERY - active 2 year-old, wish me luck! Nos vemos! (see you soon). 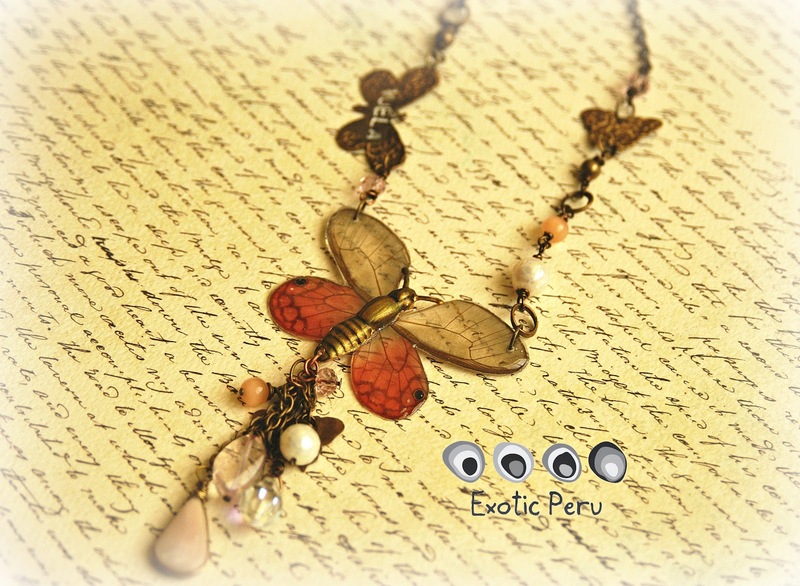 As I reflect upon the exotic cultural richness of my home country of Peru I craft my jewelry based upon the vibrant people costumes, architecture, and childhood memories of my past. After many preliminary sketches I meticulously select only the most beautiful and unique materials that I import from Peru. I delight in working with Murano glass, Alpaca Silver, Sterling silver, shells, turquoise, water pearls, crystals, coconut, leather, ribbon, stones, butterflies and exotic seeds to create the perfect harmony in every design. In addition to my Peruvian materials I also incorporate brass pieces from the U.S. 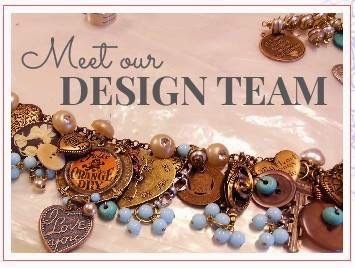 The variety of my materials allow me to explore different techniques, embossing hammering and painting metal, crocheting copper wire for a bracelet to twisting wire into different shapes for a necklace. All of these techniques combined with my unique materials coalesce into a modern, elegant, and nostalgic style of jewelry that is worthy of the name of my business, Exotic Peru. 400 South and 300 South.